How odd... a statue of a faerie at the bottom of the ocean... I wonder how that got there? The statue in the Ruins of Maraqua is not a statue at all, but is actually the Darkest Faerie turned to stone! 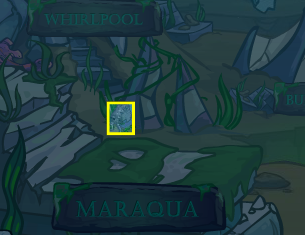 The statue can be found in the Ruins of Maraqua by clicking in the highlighted spot below. 1,014 years ago, the Darkest Faerie attempted to take over the land of Altador. As punishment, Fyora the Faerie Queen turned her to stone for 1,000 years with the use of Jerdana's Orb. However, Altador was too badly affected by the Darkest Faerie to remain a part of Neopia and so surrounded itself in a time bubble and broke away from Neopia. In the PlayStation 2 game Neopets: The Darkest Faerie, the titular character escaped from her stony prison in 2005, or 1000 years after she was sent to it. For reasons explained in the video game, Altador was brought back to Neopia after the Darkest Faerie was defeated. The Altador people had no memories of the Darkest Faerie (their memory loss was one of the side-effects of breaking away from Neopia), which led to the on-going Altador Mini-Plot. Those that have completed the video game will realize that the statue should not still be there as the Darkest Faerie escapes, and as far as the Neopian canon was concerned, the statue was residing in Fyora's personal gardens in Faerieland. After the whole city crashed, King Altador claimed the statue had been lost, but this is not supported by the Maraquan map, which has shown the statue since 2003. It's not known why the statue was not relocated or removed years before to fit with continuity. There is a disturbed kelp bed here and impression in the sand that still hasn't washed away. Wonder what was here...?